It's no secret that the inimitable editor in chief of American Vogue is highly discerning. After all, rumors abound about Wintour being the inspiration for the infamous and highly quoted Miranda Priestly in The Devil Wears Prada. In all seriousness though, Wintour's stamp of approval is one of the most highly regarded in all of the fashion industry. Fun fact: Her opinion carries such weight that Vogue staffers breathe a sigh of relief when they see the acronym AWOK (which stands for "Anna Wintour OK"). 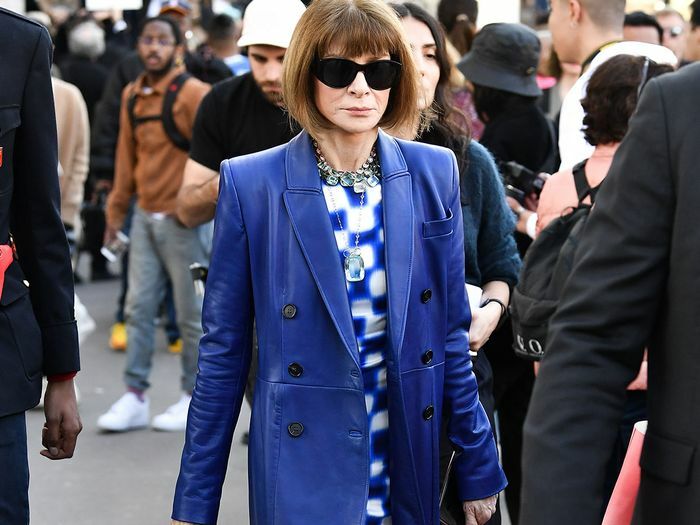 It goes without saying, then, that Anna Wintour's spring style choices—aka the pieces she actually lets into her own highly edited wardrobe—are the best of the best. When it comes to spring trends, there are four main ones that have earned the coveted AWOK label. Her style is consistent, including a uniform of black sunglasses and long, printed dresses, but this season, Wintour is also mixing in more trend pieces like '90s-style leather trench coats and snakeskin boots—in her very classic way, of course. Keep reading to see which trends Wintour is wearing, and then shop our picks of each. The '90s-style coat trend took over on the celebrity front this winter and spring as a fresh alternative to the leather moto jacket. The longer coat lends an enormous amount of polish to any look, as evidenced by Wintour's love affair with the piece. We've spotted her in leather trench coats from burgundy to blue and black. Tweed as a whole is as timeless as they come, but this season, designers have been iterating on the sophisticated texture in spring-ready pastel colors. Case in point: the lovely lavender set Wintour wore to Chanel's F/W 19 show during Paris Fashion Week with another of her favorite current trends: snakeskin boots. All throughout fashion week, Wintour continuously opted for her new favorite shoe trend: snakeskin printed boots. She styled them as if they were a plain neutral alongside her signature printed frocks and the aforementioned leather trench coats. The softer cousin of tie-dye, watercolor prints are Wintour's way of participating in spring's number one trend while also remaining true to her timeless style. We're taking notes on her elevated approach to the trend. Next, the five basics the Vogue editor in chief thinks everyone should own.